I have enjoyed each day of heart designs. I, too, collect hearts. Hi Alice, thank you for your comments, I appreciate them! Hi, I do like your page but is there some button I’m supposed to click on to enter your giveaway? There is a white box just below the last picture in the post, it has a blue star next to the work Like. Have enjoyed reading your blog. I follow and liked. Hi Christen ~ I can only LIKE, LIKE, LIKE, here. Left FB a couple years ago. Your heart series has been so much fun, I’ve look forward to each day. More beads! Hi Jean, Thank you, thank you, thank you. You will be seeing more beads next month, wait for it! Heyo! I’ve been following for a while via Feedly. I think the like button worked for me but I am not sure. 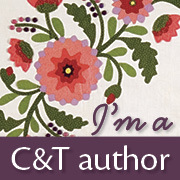 Thank you so much for all you do – I wouldn’t be an embroiderer if it wasn’t for bloggers like you. Thanks also for a chance to win! Hi CaLynn, wow I am so glad that you are a stitching, and thankful that I can be of help! Hi Abby, You have been a faithful student, and I am so glad that you share your work with me, thank you for sharing all that you have created!